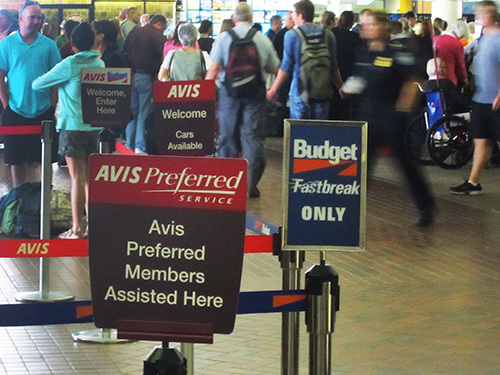 Should You Buy Rental Car Insurance When Traveling Overseas? Should You Buy Insurance When Renting a Car? Many of us wonder if in addition to trip insurance do we also need rental car insurance when traveling overseas. And let’s face it: it’s one of those things that confuses travelers the most. You’re about to rent a car and the rental agent asks you if you want to purchase insurance, and you’re just not sure. It’s happened to most of us and we’re not alone. A survey conducted by the National Association of Insurance Commissioners found that 20% of consumers always buy supplemental insurance, another 20% do occasionally and 62% don’t believe their personal auto insurance automatically covers rental cars. All this confusion is due to lack of knowledge about your auto insurance. Or you may just have the wrong information. For several years I rented cars in Europe believing I had insurance coverage when, in fact, I didn’t. And I’m certainly glad I never got into an accident. If you don’t have some kind of insurance when renting a car you expose yourself to considerable financial risk. Being involved in an accident without insurance coverage could cost you many thousands, or even millions, of dollars. Here’s an overview of what you need to know. Collision/Damage Waiver (sometimes called CDW, LDW or DW): this is not really insurance but a waiver in which the rental company agrees not to make a claim against you if your rental is stolen or damaged. It usually excludes various conditions, such as driving while impaired or driving outside a defined area or country. These costs can vary significantly. Liability Insurance: it protects you if you damage someone else’s property or vehicle and is usually in a specified amount such as $1 million. Personal Property / Effects Insurance: it covers your personal property if it is stolen from the rental car or damaged in an accident. CDW prices can be outrageous, and rental agents are often required to push them since they’re such moneymakers for the company. They can cost anywhere from $15 – $30 per day, depending on the car, the company from which you’re renting and the location where you’re renting the vehicle. Does Your Personal Auto Insurance Protect You? You often don’t need rental car insurance when traveling in the U.S. and Canada since for most of us the collision insurance we carry on our private vehicles also covers cars we rent. Thus, you can usually skip this coverage when you rent but you should check with your insurance company in advance. Important to Know: the big caveat, however, is that most times your personal auto insurance does not cover vehicles rented outside the U.S. and Canada. Again, call your insurance company (or check its website) to find out in which countries your policy provides coverage. Even in the U.S. or Canada, though, your personal auto insurance may not cover what is called “loss of use” charges, the amount the rental agency claims to lose from fees while the vehicle is in the repair shop. This, however, is sometimes covered under collision damage waiver (CDW) or loss damage waiver (LDW). You should be aware that if you are involved in an accident in a rental and are covered by your own personal insurance, inflated damage fees might cause your insurance premiums to go up in the future. 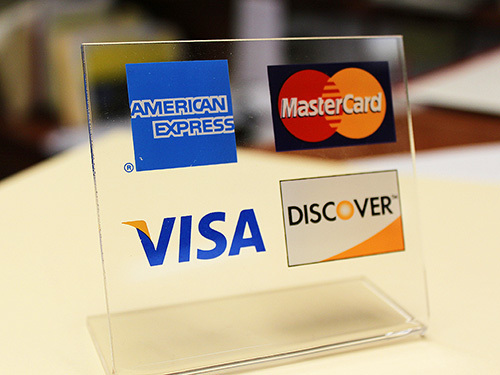 All four major card networks (Visa, MasterCard, Discover and American Express) provide some form of rental car insurance coverage, although MasterCard does not provide coverage to all its cardholders. This is usually “secondary insurance,” so-called because it only kicks in after your primary insurance (i.e., your personal auto insurance or another policy you’ve purchased) has paid various costs to the rental agency. Many, but not all, credit cards provide “loss of use” coverage when you rent using their card. Since coverage varies not only by credit card but also by state, you need to check with each of your credit card companies to find out what coverage each provides and whether you need rental car insurance when traveling. Coverage can vary greatly between cards so ascertain which offers the best coverage and then be sure to use only that card when you rent a car. The 2012 Credit Card Auto Rental Insurance Study by CardHub found that VISA’s rental car insurance received the highest cumulative score (87%), while Discover ranked second (85%), American Express ranked third (82%), and MasterCard last (73%). Important to Know: All four major networks require that you charge the entire rental car purchase on their credit card and decline supplemental insurance/Collision Damage Waivers (CDW) offered by the rental company in order to be eligible. None provide coverage for the rental of exotic, expensive, or antique cars; trucks; vehicles with open beds; or off-road vehicles. VISA and MasterCard do not cover accidents occurring on dirt and gravel roads and American Express will not provide coverage for renting certain popular SUVs. One of the better insurance programs is offered by American Express. Its Premium Car Rental Protection program provides primary insurance protection on a rental car up to $75,000 coverage ($100,000 with its Platinum card) for damage or theft. Since it’s primary insurance there’s no need to file a claim with your personal insurance company so your auto insurance premiums will never be affected if you have an accident in a rental car. The cost is also comparatively low – a flat rate of $24.95 per rental for a period of up to 42 consecutive days. Enroll in the program and you’re automatically insured anytime you use any of your Amex cards for a rental. Important to Know: the American Express Premium Car Rental Protection does not cover vehicles that are rented in Australia, Ireland, Israel, Italy, Jamaica and New Zealand. Another option is a company called protectyourbubble.com, which for $7.99 per day provides you with insurance covering damage and theft of vehicle and primary collision coverage up to $35,000 with a $0 deductible. Keep in mind also that associations such as the AAA, AARP, etc. sometimes provide rental car insurance. If you’re a member of an association contact them to ascertain your benefits. It’s a call that can save you money when you’re traveling. A good thing to do is to always inspect any rental vehicle and make the rental agent note even the most minor damage or scratches on your rental form. Also take a picture of it with the rental facility in the background. It’s easy enough to do since today just about every smart phone has a camera built into it. If you’re renting overseas always get an English version of the contract, which you typically must do in advance, usually online. After all, you don’t know what you’re signing if it’s in a foreign language and you could be accepting all sorts of liabilities and additional charges. It has happened. Rental agencies usually charge you a “loss of use” administration fee since they claim, and rightfully so in most cases, that the resale value of the car has been reduced if you were involved in an accident. Some insurance companies will not pay extra fees such as this, so it’s wise to check with your own company. if you are to be covered by your credit card for rental insurance you usually must have that rental billed to that card. If you have a coupon for a free rental or if you’re renting with frequent flyer points, even though you provide the credit card number at time of rental to hold the reservation, if no charges are made to the card by the rental company you may not be covered by the card company’s insurance. 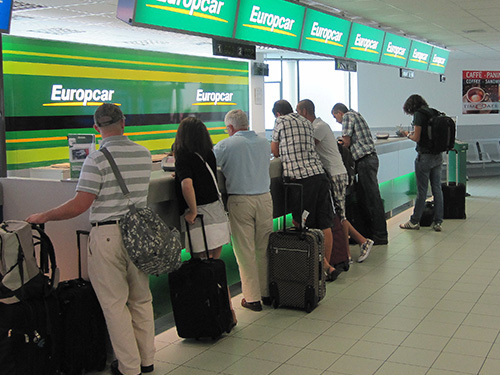 Excellent article, you gather all the information and answered all the questions I have had about renting a car not only in Europe but also here in the US. Glad it was helpful…it certainly helped me as well. We were disappointed to discover that our USAA Master Card would not cover our car while in Ireland (on your list of places not covered, I see). Boy were we glad we paid up for the insurance! Driving around Ireland’s narrow back roads we did a fair amount of damage to the left side of the car, including losing a hubcap somewhere! When we returned the car the agent took one look at it and just shook his head. Tom said, “We all good here?” and we were on our way! I was also surprised that American Express’s Premium Car Rental Protection was not valid in Ireland and several other countries that I listed above. I’m certain that other credit card companies, including MasterCard, will not issue coverage in those same countries. If a person just got a rental and does not have any auto insurance and did not get the additional rental insurance but gets in an accident (parked/notincar) with minor damages costing 500 or less , does the renter make a claim ? Or is this kind of situation handled differently ? I’m not an insurance agent but would imagine that if the owner of the other car did not pay for the damage the renter would have to sue them. But the renter is responsible for paying for the damage to the rental company. Everything would depend upon the law in the state / country where the car was rented. Insurance is something I really look forward to buy along with the car hire when I travel to a new location/country. I can manage to handle a car and have good driving skills. But I take this a as a step of precaution as I will be driving in a new country that has different driving rules, some that drive on the other side of the road as well. Most of the times Insurance is covered by my credit card but there are certain other waivers that I look forward to make use of. These are normally covered in the CDW(there are other drivers who are still learning to drive/park). Most credit card companies require that you DECLINE CDW in order for their insurance to be activated. What are your thoughts on this problem. the claim was for the ACV less salvage proceeds, less the $500 deductible, plus 15 days for loss of use, plus admin fee. The car was returned with 2,809km on it, the car was rented to others for 10 months after being returned, it was then appraised for the August 2012 damage, and discount decided to dispose of the car at that time. The claims adjuster Meena Garrett refuses to address the inequities of their claim. Your readers should be aware that Discount could dispose of the car rather than repairing the damage which was assessed by the rental rep at $200. That is some story Colin! I would think it is highly unusual – if not unethical – for a company to appraise damage to a vehicle 10 months after the fact, and after they’ve been renting the vehicle to other customers. Are you a resident of Canada? The U.S.? I’d be interested in knowing if you paid the claim or not or have gone to court about it. For what it’s worth…Three years ago, I rented a car with friends, and I paid for it with my credit card, so everything was in my name. When asked by the agent whether I wanted coverage, I opted to do so. Two days into the rental, we came out of a restaurant and found a gash in the passenger side door. I rent cars a lot on business, and we are told to always waive coverage, and I rent a care for personal use maybe once a year. Ever since my gash, I always get the coverage. The one time I needed, it sold me on using it from now own. Thats because it is NOT insurance. Its a waiver. No claim has to be filed. Thanks a lot for this useful information. I always rent cars for my business trips on cars-scanner. Good advice to record VERY carefully any pre-existing dings/cuts/scratches/nicks/scuffs/you-name-it on the rental car. In the US we may tend to do a quick walkaround, but after a major hassle returning a car at Heathrow I will never again leave the rental lot without doing a thorough examination of the car from every angle. I have a rental and declined the coverage. I just realized that I don’t have the full coverage with my own insurance, so I would not be covered for damage to a rental. Can I call the rental agency (Enterprise) and add it? I would definitely call Enterprise and see if they’ll let you do it. If they do you’ll likely have to go back to an Enterprise office to do the paperwork and so that they can ensure there is already damage done to the car. I’d be interested in hearing what they say. Can you update us here? Have you heard of a new company called insuremyrentalcar.com They have very low rates but have only been in business since 2013. Any reviews or info would be great! 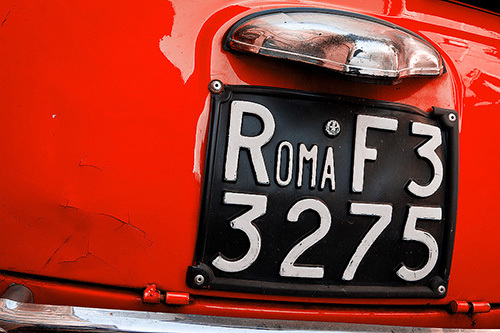 I see the Amex premium car rental insurance does not cover cars “rented” in Italy. What if the car was rented in Germany and driven through Italy. Would it then be covered? 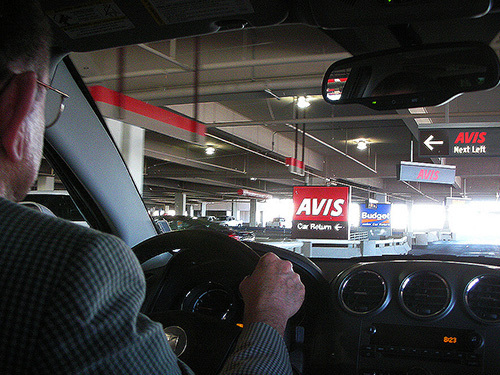 I recently rented a car at Avis in Philadelphia. Shortly after picking up the car i rear ended a car ahead of me that was stopped in an exit lane due to traffic. I have no personal insurance. I purchased the LDW but waived the liability. I’ve read that car rental agencies must provide a certain amount of liability to their renters (state law). In this case, will I have liability against the car I rear-ended? How much does that liability cover, if so? Also, does LDW cover all damages on the rental car? Avis confirmed that LDW would cover everything on the rental car but the claims officer from Avis that I spoke to today was not able to confirm. I just don’t know what to tell you about this since laws differ in every state. Did you rent the car with a credit card that provides any coverage? If so I would speak with them. I’d also speak with the Pennsylvania Department of Insurance to get a better understanding of your rights. We’ll keep our fingers crossed for you. I am renting a car from AAA do I have to take the insurance from them or will be be covered? I meant I am renting a car from Enterprise and I am insured by AAA, will it cover me or do I have to get their coverage? To be totally safe you should call your AAA insurance representative and inquire if you will be covered.You don’t want to duplicate insurance but you also don’t want to rent a car without it. I rented a car recently and denied the waiver, seeing as my VISA has the coverage. I came out to the car one day to find a dent in the car that was high up enough up that it was not from another car. Probably from a ball or person goofing around. I am reading that the Credit Card coverage is only if I don’t have insurance or, up to the deductible. I had a claim three years ago with my personal insurance and really do not want to submit a claim to them. Do I HAVE to report this to my insurance company? Will VISA check what coverage I have? It sounds to me that you’ll have to report it to your insurance company. What I would do first, however, is to call Visa (the number on your card) and ask them about your insurance coverage. In the future, if you don’t want to have to deal with your own insurance company you’ll need to use another insurer when you rent, likely the rental company. I would like to here your suggestions on how to handle this case. 1 ) Do you think its advisable to call the rental company and let them know that I’am aware of such a thing ” loss of use ” and administrative fee coming by in the future ? and that I might need such and such documents if thats the case ? 2 ) Or do you think , I should just wait out until the rental company actually sends me a bill for loss of use and administrative fee ? Which I believe would be after a long repair duration, resulting in a big loss of use fee. I think that you will likely be fully covered by American Express. I’ve used Amex’s coverage in the past and they’ve been good about it. I’d let Amex and Budget work it out and not get involved in it. I will be travelling from USA to Ireland via an AIRfare/B&B/Autorental “Package” that includes the car rental from Dan Dooley. I am paying for the PACKAGE via my credit card which will give me a “VOUCHER” for the car rental and presumably I am therefor NOT renting the car via my credit card, but via the voucher. SO …what should I do about insureance?? I belong to AAA and I have all different types of Credit cards (AMEX, MC, VISA, DISCOVER…whatever I need) so brand is not an issue. I want to minimize my costs but don’t want to leave myself exposed. What should I do regarding insurance? I would say that you are renting the car on that specific card. It is VERY important that you contact your credit card company regarding this rental. While most card companies do not provide coverage in Ireland and a handful of other countries, I have heard that some cards may have added CDW “coverage.” You need to speak directly with the card company. I’d also check with AAA. Just remember you must usually make the entire charge on the same credit card. Very useful information Jim. Thanks a ton. I am traveling from Toronto to Michigan and back in August. Although I am a US citizen I am temporarily living in England and do not drive, therefore do not have any car insurance. I am looking at renting a car for two weeks, what insurance do I need to buy? Thanks for your help, I am a little confused at the moment. 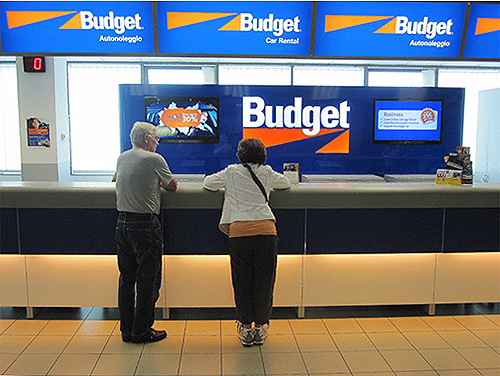 You can purchase insurance from the car rental company, although that will be expensive. A much better option is to see if any of your credit cards provides car rental insurance (just call the number on the back of your card to find out if coverage is provided). There’s no charge for that coverage, although you must use that card to pay for your rental. It sounds like a fun road trip. Have fun! Are car rental agencies required to Cary liability insurance on their car?And does that liability insurance cover the renter? I really don’t know the answer to that but my guess is probably not since they require you to buy it. I rented a car from Enterprise in Ontario, used my credit card for the insurance and declined all the insurance provided by the car renal company. However, I hit a parked car in a parking lot and scratched the paint of both cars. The rental car I was driving was covered by my credit card insurance, and that’s easy to claim. But who is going to pay for the repair fee of the other car? I contacted Enterprise, they say that although all their cars are insured by third party liability for all the drivers over 25 included in the base rate, in this case, the liability doesn’t cover the other car. I am wondering if this is correct or I miss something? To my knowledge, liability pays the lost to the third party due to my fault. Thanks a lot! Insurance is very important part of hire renting a car. You share the great info about insurance when renting a car. Thanks for sharing the great information. Good Luck! This is an important reminder when renting a car. If you were renting a commercial type vehicle would the van insurance I have at home be suitable for a rental agency. Or is this one of those questions best for my insurance agent? I apologize for the delayed reply. On a question as specific as yours, you must check with your insurance agent. Be sure to get his/her answer in writing / via email. it is extremely useful in case of accidents or minor mishaps.